An owl says “hoo dat?” as he is caught in the mist net hanging in the dark. “Damn,” the owl thinks as he is put in the cloth sack. The owl doesn’t know what to think as he is placed upside down in a plastic jar to be weighed. At the end of the ordeal is freedom…and a cool new ID bracelet to show his friends and impress the ladies. 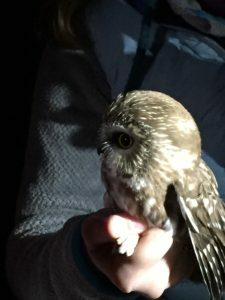 I first heard about the Cape May, NJ owl banding project in the fall of 2014. I knew that many other types of birds were banded. Song birds are caught in mist nets hung low across clearings. The nets are very fine and almost invisible. Birds are caught randomly as they commute to and from work. No doubt they simply blamed it on “the man” (which is pretty much dead on). Back in September, my wife told be about a birding feature on Vermont Public Radio that she heard. I missed it live, but was able to find it online. What really caught my attention was the mention of a Saw-whet Owl banding project at the North Branch Nature Center outside of Montpelier, Vermont. Saw-whet Owls are one of the few (if not only) owls that can be called in so close during their fall migration as to be caught in mist nets. While I have no experience in banding birds, I was hoping I could attend an evening session and watch. I found information about the North Branch Nature Center online and sent an e-mail to Chip Darmstadt, Executive Director for the Nature Center. Chip was great at getting back to me. Unfortunately, I wasn’t available for any of the October banding dates. I contacted Chip on November 2 to see if there would be any more attempts at banding this year. He said that they might have one or two nights left and that night looked pretty good for banding. He told me to arrive at the Nature Center about 5:45 and we’d check the nets at 6. Chip was very clear that it was late in the season and we might not see anything. I was excited to have the opportunity to go, even though there was no guarantee of seeing an owl. Clearly, based on the attached pictures, I was able to see some owls. It was a life bird for me, meaning a bird I had never seen. I arrived at the Nature Center before 6 PM and found where the banders were located. There were about 3 banders and several parents with their kids. The plan was to check the nets about every half hour, beginning at 6. I have seen song bird banding before and found it interesting at how calm the birds are. After they are caught, the birds are placed in paper lunch bags and left on the ground until it is time for the bagged-bird to be banded. The birds settled down when placed in the dark bags. It is the same principle as covering a bird cage or putting a hood on birds of prey used in falconry…or placing a pillow over a snoring husband’s face. So I’m told. After the birds were tagged and its vitals recorded, the bander would place the owl on a lucky child’s outstretched arm. Interestingly, the little Saw-whet Owls didn’t fly off right away. 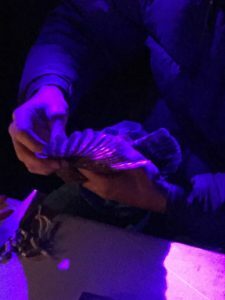 They would sit for a half minute or so, then fly off – looking like a large moth flying off in the beams of the flashlights. Sadly, they only picked the cute little kids to release the owls. I have found that people never pick the cute middle-aged men for the really cool things. Maybe they hope these small opportunities will spark something in the children that could alter the course of their lives and maybe they won’t grow up to become attorneys or accountants. Just the same, it may limit the hope of these same attorneys and accountants of becoming kids again. Just saying. Along with banding, sexing, and weighing the owls, the banders needed to determine the age of the birds. This they do by stretching out the birds wing and shining a black light on the underside of the wing. New feathers glow bright pink. 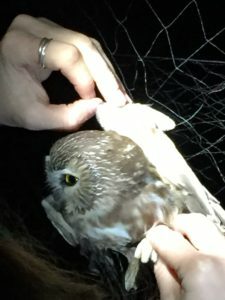 The last owl caught was a first-year bird. You could tell because all the feathers glowed pink. Other birds only had a couple pink feathers. These were determined to be second or third year birds (I can’t recall which). It was really a great night. We caught four owls – one owl the second net check at 6:30, two owls just after 7:00, and one owl around 8:00. I thank Chip Darmstadt for always replying so promptly to my inquiries and for being so welcoming to everyone who showed up to watch the banding. He is an enthusiastic steward of nature. What a wonderful treat it is for a desk-bound professional to get out, even for one night, to witness the wonders of the wild things.